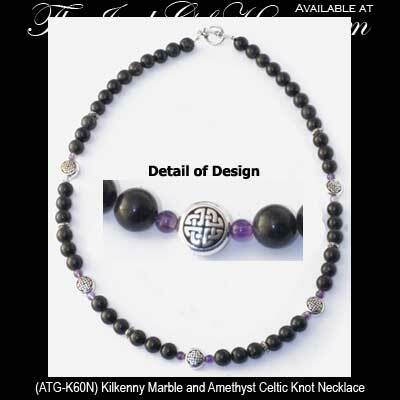 Kilkenny marble Celtic necklace is enhanced with amethyst stones along pewter knot-work beads. This Celtic necklace features 8mm Kilkenny marble beads along with amethyst accent stones and it is further enhanced with knot-work beads that are silver plated pewter with oxidized accenting. The Kilkenny marble necklace measures 20" long including the toggle clasp and the round Celtic beads measure 3/8". The Irish necklace is made in Kilkenny, Ireland by All That Glisters; it is gift boxed with Celtic knot and Kilkenny marble history cards, complements of The Irish Gift House. Kilkenny marble Celtic bracelet features knot-work beads along with amethyst. Kilkenny marble earrings feature Celtic knots along with amethyst stones. Kilkenny marble Celtic earrings feature knot-work beads along with amethyst. Kilkenny marble necklace is enhanced with amethyst stones along with pewter Celtic beads. Kilkenny marble bracelet features Celtic knot-work beads along with amethyst. Kilkenny Marble drop earrings are augmented with Celtic knots and amethyst beads.